It's been a really busy last few months for Liz Martin Creative. I'm thrilled to have been event planning, meeting new clients and developing new brands + websites! 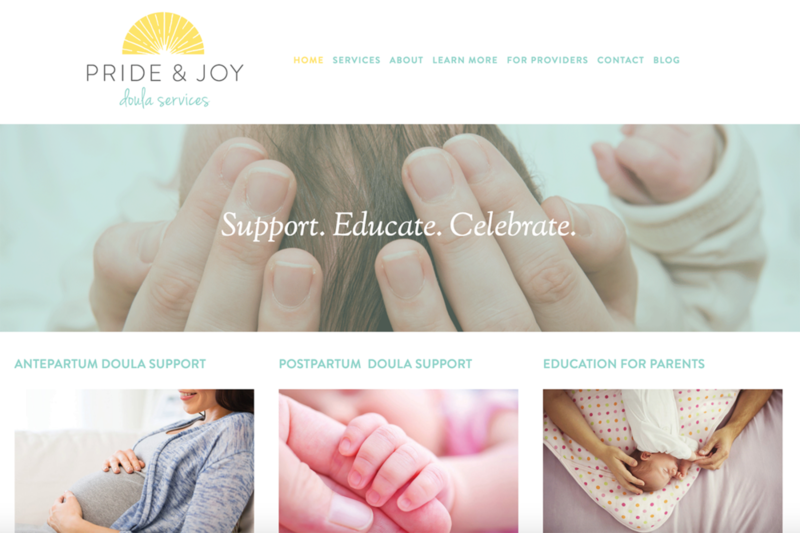 Today I am very excited for LMC client Amy Beseth and the launch of her new company Pride & Joy Doula Services, LLC. It was a true pleasure to work with Amy and help her bring her vision to life with a new brand identity/logo and website design. Amy provides doula services for her clients (new parents) through love, experience, compassion and non-judgement. Earlier I posted about the logo design process I developed for clients using Pride and Joy as an example. I plan to post about our website design process now that Pride & Joy is live (and still growing)! Stay tuned for the blog and some beautiful new branding with another fantastic client I will be sharing soon! Hello, my name is Amy Beseth and I am the owner of Pride & Joy Doula Services, LLC. First and foremost I want to thank you for exploring what I can offer you and your family, as this business is a true labor of love. I am a wife and mother to identical twins and a singleton. My journey to become a parent started with a challenge that so many face, infertility and miscarriage. We followed a path towards adoption when I became pregnant in 2010 and then again in 2013. My pregnancies were filled with high risk labels, complications and bed rest. I delivered 3 babies at 34 weeks. Though these pregnancies presented challenges - with out a doubt it was the most empowering and beautiful experience of my life. In my work with Pride & Joy, I hope to support every family so they feel the same about their pregnancy and postpartum experience. I have a Bachelor of Science degree in Family Social Science with an emphasis in Child Development through the University of MN. This set the stage of understanding the complexities that a new life can present to a family and how having non judgmental support is so important. After having my own children the journey from pregnancy and postpartum became a passion.